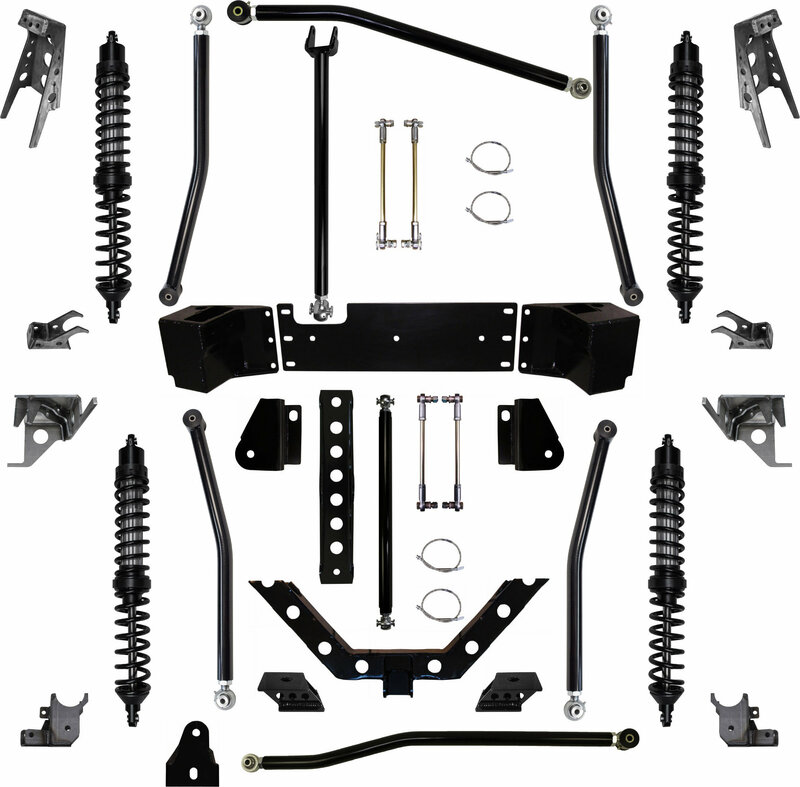 The 3.5 Rock Runner System is the ultimate trail suspension for Wrangler JK owners period! The steering geometry has been engineered to provide you with stock on highway handling characteristics. 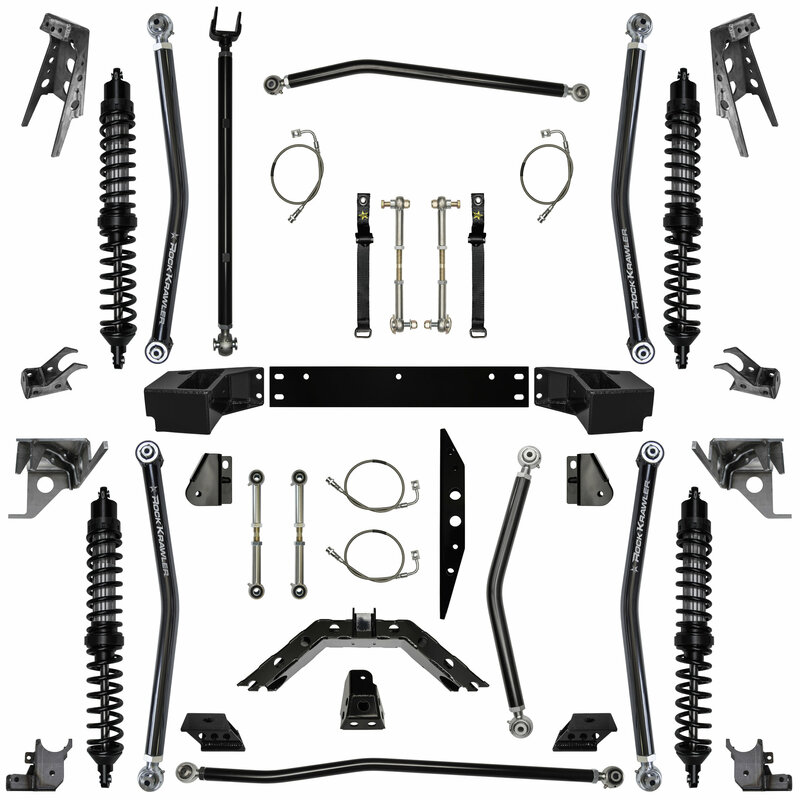 What makes this long arm system stand out above all the rest is the Revolutionary Independent Three Link conversion front and rear. This has become a Rock Krawler Suspension trade mark. All of our Jeep Long Arm systems feature this very same design up front. On the new Wrangler JK's we used it in the rear as well so no gas tank modifications would be required. The Independent Three Link has been proven as the best suspension design for high articulation demands while maintaining precise street control. There is no limit to what you can do with the 3.5 Rock Runner Long Arm System. No detail has been overlooked. The rear features adjustable anti-squat so you can tune your JK for your off-road pleasure. All the lower control arms are adjustable, have high clearance and are made from 2" solid alloy steel for extreme use. We provide you with even the little things such as heavy duty rear lower control arm mounts with integrated coil over mounts that are raised 2" to improve ground clearance. Like all other X Factor Mid Arm and Long Arm Systems for the Wrangler JK, the rear axle has been moved back 1" to allow for greater clearance between the tire and factory sliders for Rubicon Owners.